It adds a simple drop-down below the YouTube videos where you can easily select and download the video in your desired formats. Note: The extension also lets you download DASH video and audio streams. 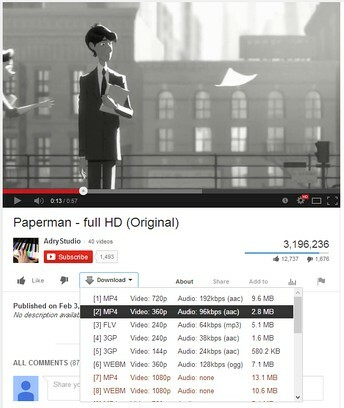 Please be aware that DASH files do not include either audio or video streams. You need to download one separate DASH audio and one DASH video file and then combine (MUX) them together in order to get a normal media. Moreover, the extension opens an instructional page for you after installation containing more information about media muxing.